The Avenue of Stars is Hong Kong's version of the Hollywood Walk of Fame, celebrating famous icons of Hong Kong cinema. 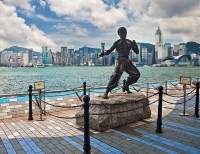 Situated along the seaside promenade, there are great views of Victoria Harbour. The Avenue is also a good place to view the Symphony of Lights, a music and laser show staged every night at 8pm. The show is presented in English on Mondays, Wednesdays and Fridays; Tuesdays, Thursdays and Saturdays it is in Mandarin; and Sundays in Cantonese. Although the Avenue is a lovely place to stroll and has some interesting landmarks, foreigners should bear in mind that they may not recognise many of the celebrities being honoured on the walk. Still, names like Jackie Chan, Bruce Lee and Jet Li may produce excitement - there's even a statue of Bruce Lee. The real reason for making the effort to visit the Avenue, however, is the spectacular view. It is worth doing the walk at night, even if you don't intend to see the Symphony of Lights show. It's also a good people-watching post and it is fun to watch the locals celebrating their favourite stars.